Jan Hare is an Anishinaabe scholar and educator from the M’Chigeeng First Nation, located in northern Ontario. As an Indigenous scholar and educator she has sought to transform education in ways that are more inclusive of Indigenous ways of knowing and languages. 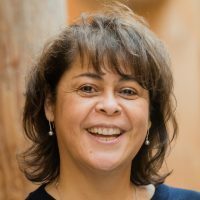 Her research is concerned with improving educational outcomes for Aboriginal/Indigenous learners by centering Indigenous knowledge systems within educational reform from early childhood education to post-secondary, recognizing the holistic and multidisciplinary nature of Indigenous education. • Enrich teacher education with Indigenous perspectives, histories and pedagogies through an integrated approach to teaching and research. • Engage in professional development of in-service/practicing teachers so they are informed of the place of Indigenous peoples, histories, perspectives and pedagogies in their current teaching. This community engagement approach with teachers and schools will transform places of learning so vital to the success of Aboriginal learners. • Extend professional development opportunities to our Education faculty. Human Resources and Skills Development Canada’s Office of Literacy and Essential Skills. UBC-HSS large grant. PI: M. Bournout-Trites. Co-investigators: J. Hare, J. Archibald. In collaboration with the BC Aboriginal Child Care Society (BC ACCS), this project sought to define notions of ‘quality’ care from perspectives of Aboriginal early childhood educators, Aboriginal parents, and community members involved in Aboriginal early childhood education programs and services in urban, rural, and First Nations communities. BC ACCS is a leading Aboriginal early childhood non-profit organization advancing research and policy. The project was facilitated by Indigenous graduate student, Danielle Mashon, who completed her Master’s thesis as part of the work. Dr. Hare and Dr. Anderson learn from the perspectives of 25 Indigenous parents and family members and two caregivers reflecting on the transition of young Indigenous children from their home to an early childhood development program. • How Aboriginal families come to participate in early learning settings, and why, forms a significant part of the transition experience. • The intergeneration impacts of colonial child welfare policies give pause to parent participation in these programs. • An emphasis on learning environments that validate their culture and language contribute to participation. • Identify initiatives, policies, and practices that advance early learning priorities in culturally diverse settings and through interdisciplinary areas of study. • Explore, as one strand of the project, Indigenous research in language, math, literacy, and learning in early childhood education. The Aboriginal Family and Community Literacy Curriculum (AFCLC) was developed to support new and innovative training and professional development opportunities for early childhood staff and educators, as well as Aboriginal parents, engaged in designing, implementing and evaluating Aboriginal family literacy programs for urban Aboriginal families in literacy projects associated with Aboriginal Head Start programs. • How do early learning programs that support Indigenous children and families engage with early literacy practices and materials? • How do Indigenous parents and community members value and take up early literacy practices promoted in Aboriginal Head Start settings? • How are Indigenous ways of knowing incorporate in to practices of early learning settings? • Understand instructional designs that support learners to engage with Indigenous knowledges, perspectives, and pedagogies in online learning envirnoments. • Identify ‘wise practices’ that balance respect for sources and carriers of Indigenous knowledges along with technological constraints and opportunities of online learning. • What digital resources do young children from culturally-diverse backgrounds have access to, utilize, and for what purposes? • What messages and beliefs are conveyed by caregivers and early childhood educators about the use of digital resources? • This course helps participants envision how Indigenous histories, perspectives, worldviews, and approaches to learning can be made part of the work they do in classrooms, organizations, communities, and our everyday experiences in ways that are thoughtful and respectful. • Reconciliation as a lens for the course emphasizes changing institutional structures, practices, and policies, as well as personal and professional ideologies to create environments that are committed to strengthening our relationships with Indigenous peoples. • This MOOC is comprised of 6 units and is offered October 2017, January 2018, and October 2018. • Principal Investigator of this grant for which I received $283K to develop an Aboriginal Family and Community Literacy Curriculum (AFCLC) consisting on 8 learning units that builds literacy knowledge and skills of Aboriginal staff, parents and educators who are engaged in designing, implementing, and evaluating family literacy programs that support Aboriginal children, youth and families. • It is a project that was developed in partnership with the Aboriginal Head Start Association of BC (AHSBC). • We have delivered the curriculum to over 40 Aboriginal Head Start sites across Canada. • Current research extending from the project examines the role of literacy in Aboriginal families and potential of early intervention programs to support early and family literacy experiences. • This certificate program will provide training in Aboriginal language immersion education to language speakers working in early childhood education (ECE) contexts. The certificate program is made up of five 3.0 credit courses that have been designed for mixed mode delivery. • Developed in consultation with BC Aboriginal Child Care Society and UBC second language educators. • As Principal Investigator, the project received $98K from Ministry of Advanced Training in Education (Aboriginal Special Projects), organizing consultations, hiring and meeting with curriculum writers, organizing course reviews and promoting the certificate in ECE communities. Developed the newly required teacher education course in the Faculty of Education at UBC. Course development based on broad faculty consultation. This website is a digital learning resource aimed at supporting the teaching and professional development of educators in Aboriginal/Indigenous education. This online learning tool is intended to promote the place of Indigenous knowledges, knowledge holders, and pedagogies in schools and communities that will enrich classroom experiences for all learners. Educators are encouraged to utilize the broad range of resources that are organized according to eight topics relevant to current issues in Indigenous education. Unique to this online website is the focus on Indigenous perspectives, curricular resources (e.g. links, texts, children’s literature), multimedia, and literature that link theory to practice. The project brings together teacher candidates, school associates, and faculty advisors to plan, implement, and assess teaching and curriculum related to Aboriginal perspectives, content, and learning approaches as part of the practicum experience. It aims to enhance the practicum experience and contribute to sustainability of Indigenous ways of knowing in classrooms through supported mechanisms that include e-mentoring, coaching, and collaboration. IPC brings together Education faculty, instructors, and graduate teaching assistants to strengthen their understanding and commitments to pedagogies that foster critical cross-cultural learning and contribute to Indigenous frameworks of reconciliation, decolonization, and self-determination. The emphasis is on helping instructors understand the epistemological traditions that operate behind Indigenous education teaching practices so they may apply these to their own coursework. • Share pedagogical innovations and promising practices that support Indigenous pedagogies in classroom teaching. • Facilitate dialogue about the possibilities, challenges, and dilemmas for Indigenous pedagogies in teaching and learning. Hare, J. (2007). Aboriginal Education Policy in Canada: Building capacity for change and control. In R. Joshee & L. Johnson (Eds. ),Multicultural education policies in Canada and the United States (pp. 51-68). Seattle, WA: University of Washington Press/UBC Press. Hare, J. (2003). Aboriginal families and Aboriginal education: Coming full circle. In J. Barman & M. Gleason (Eds. ), Children, teachers and schools in the history of British Columbia (2nd ed., pp. 411-430). Calgary, Alberta: Detselig Enterprises. Hare, J., & Barman, J. (2000). Aboriginal education: Is there a way ahead? In D. Long & O. Dickason (Eds. ), Visions of the Heart: Canadian Aboriginal issues (2nd ed., pp. 331-359). Toronto, ON: Harcourt Brace. Hare, J., & Anderson, J. (2010). Transitions to Early Childhood for Indigenous Children and Families in Canada: Historical and Social Realities. Australian Journal of Early Childhood. Marshall, S., Charles, G., Hare, J., & Ponzetti, J. (2005). Sheway’s services for substance using pregnant and parenting women: Evaluating the outcomes for infants. Canadian Journal of Mental Health, 24(1), 19-34. Hare, J. (2004). Is the bingo palace burning? Signs. Special Issue: Development Cultures, New Environments, New Realities, New Strategies, 29(2), 589-591. Hare, J. (2004). They Beat the Drum for Me. Education Canada, 44(4), 17-20. Hare, J. (2007). Strategies that Support Language and Literacy among Aboriginal Children and Families: Aboriginal Head Start On-Reserve Programming. First Nations & Inuit Health Branch of Health Canada. Hare, J. (2007). Listening to the Words of Youth: Report of the First Nations Youth Mobility Project (Phase 1). Sponsoring organization withheld to ensure anonymity of First Nations community participation in research project. Archibald, J., Hare, J., Pidgeon, M., & Vander Woerd, K. (2004). Housing: Understanding its wholistic relationship to Aboriginal post-secondary student success. Canadian Mortgage and Housing Corporation. Marshall, S., Grant, C., Hare, J., & Ponzetti, J. (2003). Evaluation of Sheway’s Infant Services: Report to Vancouver Coastal Health and BC Ministry of Child and Family Development. University of British Columbia. Hare, J. (2006). Aboriginal Education Policy in Canada: Bringing Capacity to the Forefront. Dialogue on Multicultural and Diversity Policies in Canada and the United States: Symbol or Substance, University of Buffalo, NY, USA. Hare, J. (2008, November). The Role of Early Literacy in Aboriginal Early Childhood Education Settings. Presenter, BC Aboriginal Child Care Society Annual Conference, Vancouver, BC. Hare, J. (2008, May). Accessing Early Literacy Resources On Reserves. Invited panel speaker, Word to Word: Literacy Work in Tribal Schools and Aboriginal Communities. Canadian Library Association National Conference. Vancouver, BC. Hare, J. (2007, June). Aboriginal Family and Community Perspectives on Early Literacy. Human Early Learning Partnership Seminar Series: Research in Aboriginal Communities. Vancouver, BC. Hare, J. (2007, January). Emma Crosby on the Northwest Coast of British Columbia. Vancouver Public Library Book Talk, Vancouver, BC. Hare, J. (2005, November). Aboriginal Perspectives on Literacy. Kaw na ka tsh s (Unpacking Our Bundles) in Developing Cultural Awareness, University of Toronto, Toronto, ON. Hare, J. (2005, November). Researching from an Indigenous Perspective. Office of the Provincial Advisor for Aboriginal Infant Development Programs, Vancouver, BC. Hare, J. (2004, July). To Know Papers: Aboriginal Perspectives on Literacy (The First Generation). Funds of Knowledge, Department of Language and Literacy Education, Faculty of Education, UBC, Vancouver, BC. Hare, J. (2003, July). Aboriginal Responses to Drawing the World. Drawing the World Panel, Vancouver Art Gallery, Vancouver, BC. Hare, J. (2008, December). Before Children Get to the Door: Transitions to Early Learning for Aboriginal Children and Families. World Indigenous Peoples Conference in Education, Melbourne, Australia. Hare, J. (2006, December). Canadian Voices Panel: Strengthening our Families and Communities through Literacy. New Zealand Association of Research in Education, Rotorua, New Zealand. Hare, J., & Pidgeon, M. (2006, December). Educational Experiences and Career Aspirations of First Nations Youth in Two Communities. New Zealand Association of Research in Education, Rotorua, New Zealand. Hare, J. (2006, April). Beyond School: An Interactive Symposium for Educational Researchers Investigating Cultural Practices in Cultural Places. American Educational Research Association, San Francisco, CA, USA. Hare, J. (2005, February). Strength and Resiliency of Aboriginal Families in Canada. Hawaiian Sociological Association, Hawaii, USA. Hare, J. (2002, April). Aboriginal Literacy: Land, Family and the (Re) Making of Meaning. American Education Research Association, New Orleans, LA, USA. Hare, J., & Anderson, J. (2008, April). Connecting Communities, Connecting Cultures: Transitions to Early Childhood for Aboriginal Children. Canadian Society for Studies in Education, Vancouver, BC. Mashon, D., & Hare, J. (2008, April). Defining Quality Care in Aboriginal Early Childhood Settings. Canadian Society for Studies in Education, Vancouver, BC. Hare, J. (2007, October). Becoming Critical Consumers of Early Literacy Programs in Aboriginal ECD Settings. Keynote speaker, BC Aboriginal Head Start Conference, Richmond, BC. Hare, J. (2006, November). Realizing Quality Care in Aboriginal Early Childhood. Plenary speaker, Quality Child Care: It’s in Our Hands Conference, Richmond, BC. Hare, J., & Barman, J. (2006, October). Methodist Mission Education for Aboriginal and Chinese Girls in British Columbia. Canadian History Education Association, Ottawa, ON. Hare, J. (2005, December) Transitions to Kindergarten for Aboriginal Children and Families. National Aboriginal Head Start Training Conference, Winnipeg, MB. Hare, J. (2005, April). A Case Study of Literacy in an Early Childhood Setting. American Educational Research Association, Montreal, QC. Hare, J., & Pidgeon, M. (2004, November). Housing for Aboriginal Students. Plenary presentation, Bridges and Foundations CURA Conference, Saskatoon, SK. Hare, J. (2004, October). Increasing Capacity for Research and Evaluation in Aboriginal ECD. Plenary presentation, Connecting the Dots: Sharing and Learning for Urban Aboriginal Families, Vancouver, BC. Charles, G., Hare, J., & Stokl, M. (2004, May). Sheway: Single Access Interprofessional Health Practices for Pregnant and Parenting Women with Substance Abuse Problems. Altogether Better Health: Progress in Interprofessional Education and Collaborative Practice Conference, Vancouver, BC. Hare, J. (2003, December). Literacy Programs for First Nations Early Childhood Education. Speaker, Unity for the Children: Aboriginal ECD Provincial Training Conference. Vancouver, BC. Anderson, J., Morrison, F., & Hare, J. (2003, April). PALS – A Culturally Responsive Family Learning Program. First Nations Schools Association 7th Annual General Meeting and Conference, Vancouver, BC. Hare, J. (2003, May). Aboriginal Families: Equity and Access to Health. Speaker, College of Physicians and Surgeons of British Columbia, The BCMA and The BC College of Family Physicians 12th Annual Ethics and Justice for All Conference, Richmond, BC. Hare, J. (2002, October). Reading Historical Documents from a First Nations Perspective: Processes and Interpretations. World Indigenous Peoples Conference, Kamloops, BC.